In this way, Dr Xargle, our friendly alien teacher, starts to teach his class about human babies. They must be wrapped in hair of a sheep to keep them warm. They eat egg-mangle from a prong. And they spend all day covering themselves in mud, banana and the fur of creatures called Tibbles and Marmaduke. Have you ever heard of anything so weird? 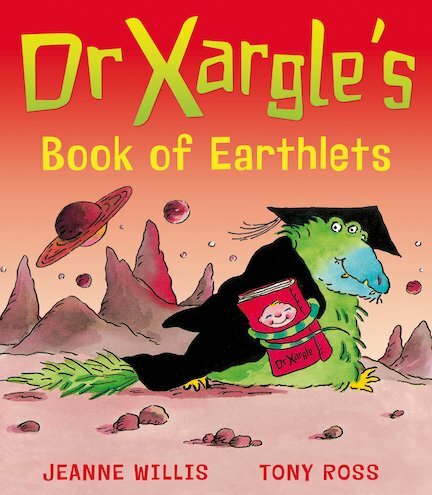 Chortle along as Dr Xargle teaches his class of baffled little aliens about stinky baby Earthlets and their peculiar habits! Jeanne Willis is the author of Who’s in the Loo? AD810L Lexiles are the global standard in reading assessment. They are unique as they are able to measure a child and a book on the same scale – ensuring the right book gets to the right child at the right time. Dr Xargles is not from earth and he doesn’t know what humans are.